On February 12, 2015, the Milwaukee County Zoo successfully hatched a male southern ground hornbill chick. This was the first egg ever recorded as laid by mother Hornrietta, which is significant since she is 34 years old and at the top end of known reproductive viability. Fortunately, our zookeepers witnessed the egg being laid and were able to retrieve it. Since Hornrietta laid the egg at such an old age, it was unlikely the egg would be fertile, but ultimately it was. The chick was hand-raised, a labor intensive process that involves hand-feeding pinky mice innards every two hours for the first several days of its life. These feedings are gradually spread out as the chick grows. The pinky mice are slowly substituted with fuzzy mice and then chopped whole mice. Finally, bird of prey carnivore diet, bugs, and dog food are introduced. The chick was reared with a puppet to prevent him imprinting on humans, and he could hear a recording of his parents vocalizing to familiarize him with normal hornbill vocalizations. 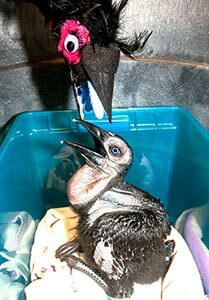 The chick was transferred to the Potowatami Zoo on April 23, where they have a group of hornbills they have raised over the last few years. They are cooperative breeders, with extended family units where the young sub-adults help raise new chicks. This environment would not have been possible at our Zoo, so this move gives him the best chance to develop the appropriate skills he will need to become a breeder in the future. This birth is a particularly significant one, since mother Hornrietta is one of the oldest captive hornbills to reproduce successfully. This breeding was also the first of its kind for our Zoo. The hand-rearing of this animal was a cooperative effort by the Aviary staff, and the event as a whole also involved staff from other animal areas. It was truly a Zoo-wide effort.